Indochine has garnered a reputation as one of the most inviting Thai and Vietnamese restaurants in Wilmington, and for good reason. The vibrant and colorful menu is almost overshadowed by the exquisite surroundings, which includes an extensive outdoor dining and bar area that is accented with gardens, beautifully-landscaped ponds, and décor that transforms the space from an eatery in Cape Fear to a true worldly getaway. While the stunning garden is best visited during the summer season, patrons throughout the year will be treated to an extensive menu that features a host of Thai and Vietnamese staples. Featuring starters, soups, entrees, specialties, and even sushi, diners can sample a world of Asian delights without ever leaving the Cape Fear region. 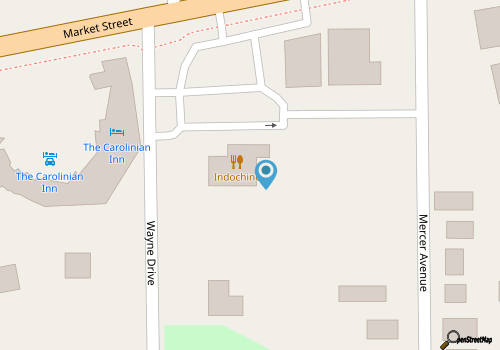 Traditional cuisine is available for both lunch and dinner patrons, such as Thai curry, fried rice and noodle dishes, egg rolls, pot stickers, and dumplings, but the Indochine specialties is where newcomers will want to start first. Incredible and on-of-a-kind dishes like the scallops with ginger, the Vietnamese pork meatballs, and the Crispy Bird Nest Noodles will make any visitor an Indochine fan. With a full selection of unique and classic dishes, in addition to an extensive beer and wine menu, Indochine reigns supreme when it comes to perfectly executed Vietnamese and Thai fare. Call (910) 251-9229 for current hours.